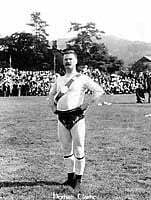 The wrestling costume (no boots, belts or braces) was ‘de rigeur’ from 1852 until recent years, and even today (see picture of Tom Harrington left), the traditional costume is compulsory for World Championship contests in Cumbria. At Grasmere, competitions are held to select the best dressed wrestlers in different groups. Highly decorative designs result, but they must always have the initials of the wrestler built into the design somewhere. The Grasmere Guides Race to the top of Silverhowe was first introduced in 1868. Hound Trails have always been a very popular feature of the Sports and like the Guides Race, date from the first regular Sports meeting in 1868. The longest surviving photograph of the Sports was taken by William Baldry in 1872. He was originally the village schoolmaster, but turned his hand to photography and the more profitable Real Estate business opportunities in the village. This photograph of Hexham Clarke, a well known Cumberland and Westmorland style Heavyweight wrestler, was taken in the late 1890’s. He wears a championship belt which was generally rated more highly than the financial rewards. The current Grasmere Guides Race record of 12 minutes 21.6 seconds over the Butter Crags course, was set by Fred Reeves in 1978 and is still unbeaten today. The course record, established on May 16th 1985 in an Amateur event, is held by Kenny Stuart with a time of 12 minutes and 1 second. 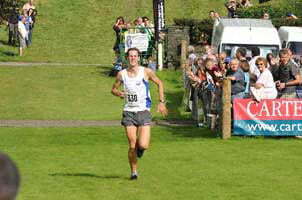 Reeves won the Grasmere event 8 times altogether. Bill Teasdale, a local shepherd from Caldbeck, won the event 10 times during the 50’s and 60’s – 5 times consecutively. Since first winning the Senior Guides Race in 2000, Robb Jebb of Bingley has so far won the event 8 times and been 2nd and 3rd on the other two occasions. He now has 6 consecutive wins to his credit – 2004/5/6/7/8/9, and has equalled the record for the most consecutive wins in the Senior Guides Race which dates from 1868. £500 is still being offered to anyone who can beat Reeve’s record. There are also Guides Races for Under 17’s, Under 14’s , Under 12’s and Under 9’s over shorter distances on the same course. 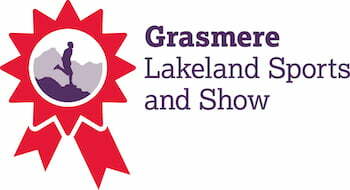 The Dog Show is now a popular attraction as well as special show items introduced for each annual Grasmere Lakeland Sports and Show, a growing traditional event in the Lake District.